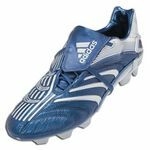 Adidas soccer cleats are claimed by many the best in soccer footwear industry. Are they really? Well, it is a subjective statement and it all depends on personal preferences and opinion. 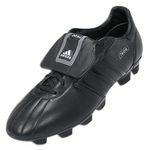 However, I think we can all agree that Adidas cleats are among the most popular and...best soccer shoes. Therefore if you choose to buy Adidas soccer cleats, you won't be disappointed. At least you shouldn't be...if you select the right model. Ya! Easy to say. But which of the Adidas cleats are adequate for me?, you ask. You are absolutely right. It's easy to say but also it is not this difficult to make the proper choice. Just follow my recommendation below and you will do just fine. Sale for Soccer - members only area that gathers current discounts, promotions, special offers, coupons and clearance on soccer equipment from around the net. No need for you to search through 100+ soccer stores - I do that for you. Before you start, I'd like to point out that recommended soccer cleats for competitive or advanced players are not forbidden for beginners or recreational players. I just don't think someone who starts playing soccer or plays it recreationally, needs high-end soccer cleats stuffed with newest technologies that make them very expensive. But if you have extra money...why not. The other way around...? Advanced players getting boots for beginners...? Well, although it won't cripple them I wouldn't suggest it. The 9th member of Predators family. Upper: Kangaroo Leather or Microfiber. Available for SG, FG and TF. Also available in Junior size: 1-6. 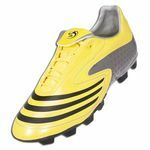 Less expensive version of Predators PS. The least expensive version of Predators PS. Previous model of Predators released in 2006 is still available in stores and on Ebay (as of July 2008) for discounted prices, as well as less expensive versions Absolion and Absolado . The revolutionary F50 TUNIT is easily constructed from interchangeable components, which come in a variety of styles and functions. Simply by mixing and matching their components of choice, each player can easily build and tune their cleats. 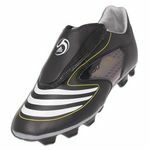 In F50.8 model (2008) Adidas adds fourth exchangeable part: the insoles. It also introduces totally new in soccer cleats, transparent element called AllesKlar. Components from all versions are compatible with each other. These Adidas soccer cleats have been styled around F50.8 Tunit. They are regular soccer cleats with fixed sole plate and stud configuration. Inspired by the Adidas classic models from the late 70s. Basically it's a less expensive version of AdiPure cleats. Recommended for beginners, recreational and even for competitive players. Classic look straight out of 1974 but with the performance technologies of 2006. Available for SG and FG. Released almost 30 years ago Copa Mundials are the world's best selling soccer cleats (incredibly still a top seller to this day). Outsole: Dual-density PU with 12 molded studs. Great for either HG or FG. SG available as Adidas World Cup (same thing, just different language). Which soccer cleats are your favorite? Click here to read about other people's favorite soccer cleats. Adidas has been the worlds leading soccer (football) brand since the days when founder Adi Dassler made his first pair of soccer boots well over 80 years ago. 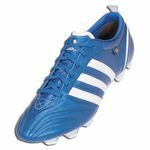 I can surly say that Adidas soccer cleats maintain their global leadership position in soccer, not because of a market share statistics but because of its historical influence in soccer cleats development. 1950  first soccer boots with molded multi-studded rubber sole (Samba). 1954  first ever removable screw-in studs. 1956  introduction of revolutionary nylon-based polyamide sole units. 1974  first use of Kangaroo Leather in soccer boots. 1977  first soccer boot outsole made from materials with different densities. 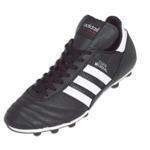 1979  release of the world's best selling soccer boot ever Adidas Copa Mundial. 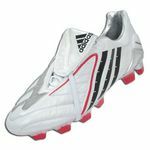 1994  first external components in soccer cleats, revolutionary Predators. 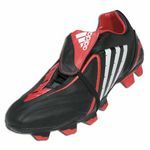 2006  first soccer cleats with multi-interchangeable component, F50 Tunit. Adidas Soccer Cleats on Ebay - Before you purchase Adidas cleats anywhere else, discover Adidas soccer cleats on Ebay auction right now! It's live straight from Ebay. 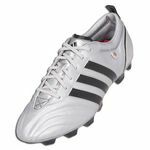 There is a good chance that you'll find here better deal on brand new Adidas cleats than at any store.